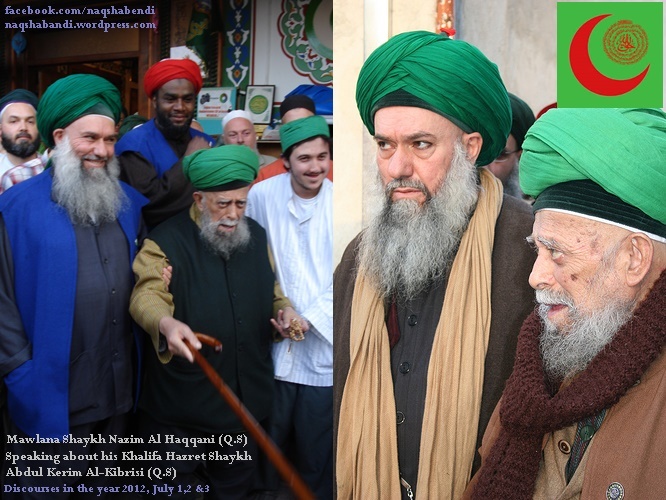 Shaykh Mohammad Nazim Al-Haqqani An-Naqshibendi, Sohbat of the 1st of July 2012.
can make it all upside down! S.H. He went like a lion! I went & saw him. He is like a lion. S.H. I would insult him, poke him from here and he would laugh. Mawlana Shaykh. He started his mission there now. He is not from the common people. No! No! One man,one man on his own stirred up the whole country. S.H. No one put anything in his food to poison & kill him? saying like this. I cried for you. I may cry now that you see it? I cried. I cried a lot at midnight. I cried a lot, O Hussein. S.H. Upon the power/support that comes from you, not by his own will. S.H. No Mawlana, with your support..
Shaykh Mohammad Nazim Al-Haqqani An-Naqshibendi, Sohbat of the 2nd of July 2012.
salam- “Salamun Qawlaan Min Rabbin Rahim” (36:58). one was like a son to us. He was a countryman, he was a villager. He was a young Muslim from a village which no one heard of,or knew it’s name. He knew as much as he had learned. will hold on to it. Unbelief-kufr will be destroyed & the fortresses of faith will be high. Ya Rabbi tawba ya Rabbi. Tawba Ya Rabbi tawba Astaghfirullah. Fatiha. Shaykh Mohammad Nazim Al-Haqqani An-Naqshibendi, Sohbat on the 3rd of July, 2012. Akbar Wa lillah al Hamd”. The deceased was like my son. He was like my son. our Prophet (sas), then for all the prophets & saints. Mehmed! Who looks over them now? Who is looking over now in AbdulKarim’s place? Mawlana. Ok good, he is Ottoman. Ottoman. These are all the ones who are in US. Guest. Yes, most of them are from US. Mustafa Hoja is the deputy in Germany. Guest. I am kissing your feet on behalf of S. AbdulKarim. Mawlana. Astaghfirullah! Allah gives you much more chance to be on right way that he was trying to keep it. Take up the flag of Islam, up always. Don’t come to say “I am this one, I am that one”.No. We are all obedient servants. Allah.. Pray for me. I am weak. I am weak. Asking forgiveness from my Lord Almighty Allah. Fatiha. Guest. Please pray that we can continue his work. asking only straight way to the Holy Prophet (sas), to awliyas. Nothing else. people &his work saying “we have separated from you”. But pray.. Guest. We are not separated from you. M. No, no. We are all servants. Naqshbandi servants. Finished. We are not asking from earth.We are asking from Heavens- our gift, or reward. That is. Masha Allah Masha Allah. Guest. Insha Allah we want to build Sh. Abdulkarim’s maqam in New York. Mawlana. Ok, ok. No harm. He will be happy with this. Insha’Allah he will stay as the Master there. His service is accepted. Are you Turkish or German? Guest. I am Turk, Ottoman insha Allah. Mawlana. Really, are you Ottoman? From Menemen (Izmir)? Mawlana: There is nothing like “it is your place, this is my place…” We are all obedient servants for Allah Almighty. We are asking nothing else. We are asking His forgiveness only. Not to say “I am this one or I am that one”. No! I am nothing. But since 80 years, always my Grand shaykh- I am kissing (his) feet up to day. Guest. Yes, I am in New York. Mawlana . Masha Allah. All of you have nur. Masha Allah Masha Allah. You may take up holy flag of Prophet, peace be upon him. And keep each one, another. If not listening me, I have.. Where is my stick? My stick may reach from East to West! I am nothing but sometimes something! Anything you may ask, ask… No, not to me. Who is now on yourself,who is appointed? Mawlana . Luqman Effendi? Ask him. Guest. You accept him as deputy? Mawlana. How I won’t accept? They will put me as deputy rather? They are..
Mawlana. It is accepted. Show respect & make service. May Allah make you plenty & your majesty go up. Guest.Allah bless you.Allah gives you health & strength. Mawlana. Amin. What can we do? Our situation is like this. Pray for us, in this holy night- the Night of Baraat. Where is this one from? Guest. This one is Greek. He is building our mosque there. M. Iranian? S.N. He is Greek Sayyidi. Mawlana. Greek? Speaking Greek & joking. Athens? Masha Allah. Speaking Greek & joking. I am tired! Guest. This is for Sh. AbdulKarim Effendi (sweet).